This is an illustration of Siats meekerorum. A new species of huge carnivorous dinosaur has been discovered here in North America. While this is not a dinosaur blog, I found it interesting that this new species has been dubbed Siats meekerorum. The name was derived from Siats, the giant, humanoid, cannabalistic monsters from Ute mythology. The Ute tribe are Native Americans who traditionally inhabited the Great Basin, though now they now are mostly found in Utah and Colorado. They tell stories of giant, trickster humanoids that are called Siats (females were called Bapets) who would kidnap children. The females would force the children to nurse from their breasts, poisoning and killing them. They would then eat the children after they were dead. Siats and Bapets were thought to be nearly immortal, though they could be killed with obsidian arrows or spears. We know that nearly every Native tribe in North America has bogey man stories such as these. It is thought that many (if not all) of them derive from sasquatches sharing the lands with the Native people. Now, the Ute Siat has transcended mammalianhood and has had its name bestowed on a reptilian monster. 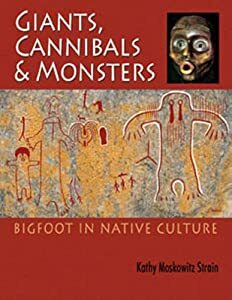 For more on monsters in Native cultures, and their possible connection to sasquatches, check out Kathy Strain's excellent book by clicking this link. Very interesting. I read about the new dinosaur, but did not know the origin of the name. Thanks for the good details. My great great grandmother was supposed to be a full blooded Indian, Cherokee I think. I have never heard this story..spooky. At least it isn't real! Now the Dino, didn't know about that either..looks like a T-rex of sorts, doesn't it? Awesome how new things keep getting discovered! Maybe it will be the Squatch's turn soon?